The 18-month-old's mother was found dead in the driver's seat, officials said. An 18-month-old girl was in critical condition today and her mother is dead after their car crashed in a frigid Utah river and they were not found for 13 hours, police said. The car was upside-down when it was discovered at around 12:30 p.m. Saturday in the Spanish Fork River, about 50 miles south of Salt Lake City, the Spanish Fork Public Safety Department said. Emergency crews tipped the car on its side and found the baby in a car seat in the back, officials reported. The baby's mother, Lynn Jennifer Groesbeck, 25, was found dead in the driver's seat, officials said. "The baby was in a car seat in the backseat on the passenger side," Lt. Cory Slaymaker, Spanish Fork Police Departments said. "The vehicle was on its top, so the car seat could have been out of the water. The car was on the embankment, so I don't know how much water was getting into the car." He said the water was so cold that the rescue crew members could only stay in for short periods of time. The little girl, Lily, was taken to Primary Chidren's Hospital in Salt Lake City, where she was in stable but critical condition, police said. According to the family, Lily was breathing on her own Sunday evening. It is believed the car was in the river for more than 13 hours, police said. "Where the car was at you couldnt see it from the roadway," Slaymaker said. 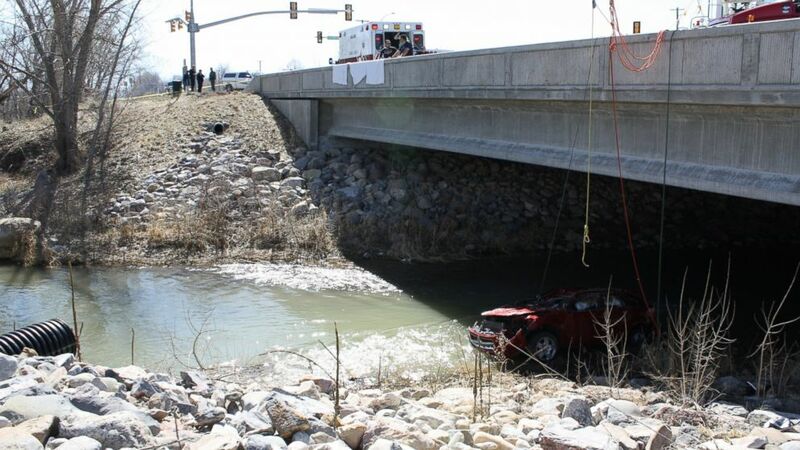 (Spanish Fork City Police Department) A baby was rescued alive from a car overturned in a Utah river on Saturday, March 7, 2015. A nearby resident reported hearing something around 10:30 p.m. Friday, but didn't see "anything out of the ordinary," the public safety department said. The woman may have hit a cement barrier on a bridge before driving into the river, officials said, but it is unknown why she left the road. The Spanish Fork Police Department and Utah Highway Patrol were investigating the accident.